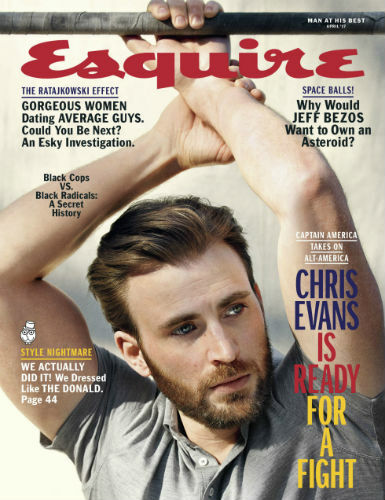 –Chris Evans made the entire internet swoon today with his new Esquire cover story. He talks about how his Marvel contract is done after the next two Avengers movies, and about being outspoken against Trump (“Look, I’m in a business where you’ve got to sell tickets. But, my God, I would not be able to look at myself in the mirror if I felt strongly about something and didn’t speak up… If I state my case and people don’t want to go see my movies as a result, I’m okay with that”). He also jumps out of a plane with the interviewer. –Ewan McGregor said”I’m f*cking proud to be a woke bae!” (right after someone explained to him what that meant). –Ben Affleck announced last night in a Facebook post that he just got out of rehab. Sources say he checked in immediately after the Oscars and it was his own decision, not prompted by any specific incident. –Kim Kardashian West believes the robbers who attacked her in Paris were monitoring her social media usage. Well, yeah. –Mandy Patinkin reportedly “burst into tears” watching Jake Gyllenhaal on Broadway. -Nicole sent me this video last night of Prince William dancing at a club with the text “we have the same top moves.” She’s not wrong. -How to Get Away With Murder’s Aja Naomi King might be dating co-star Alfred Enoch? I ship it. -Oh god. On the anniversary of the Fappening, more alleged intimate photos of actresses are being circulated online, and this time Emma Watson and Amanda Seyfried are among the targets. –Sarah Paulson, stylist Karla Welch and Ruth Negga look amazeballs on the cover of THR. –Charlie Hunnam says he is “profoundly germophobic” but he has a good reason for it — blindness caused by dogs. –The Good Fight will return for a second season on CBS All Access. I like it but not enough to go searching for downloads so I’m am so, so glad it airs like a regular TV show here in Canada. -Also getting a second season is FX’s Legion. I’m on the fence about that one. It sure is pretty but I don’t know if there’s a lot of there there. -We’re getting a Rihanna–Adam Driver musical drama? OK THEN! –Kelly Clarkson has a giant mounted bear in her living room like the gd boss that she is. -The season finale for This Is Us aired last night and it was…not good. Like, really not good. This is what happens when you build your show around a gimmick (and when you already delivered your best emotional wallop two episodes ago). It’s no surprise producers are already promising a “lighter” season two. -Also, if this is how Jack dies I’m going to scream. –American Gods’ first trailer takes us into Neil Gaiman‘s trippy world. –Oprah fights for justice for her mother in the first trailer for HBO’s The Immortal Life of Henrietta Lacks. I wasn’t sure how they’d be able to adapt that book but this looks GOOD.